Finance minister Arun Jaitley announced the abolition of the Foreign Investment Promotion Board (FIPB) in his Budget for 2017-18 as part of efforts to attract overseas investment and make it easier to do business in India. He also announced that further liberalization of the FDI policy is under consideration. While, the FIPB had the final say in approving Foreign Direct Investment (FDI) overture in the country for long, its power has been methodically reduced under the current government. Most notably, back in June, 2016 the government had announced relaxed FDI norms in civil aviation, single brand retail, pharmaceuticals, airports and animal husbandry and food products. He also announced that over 90 % of the total FDI is coming through automatic way and only 10 % has to go through the Foreign Investment Promotion Board (FIPB). Nowadays, about 90% of the Foreign Direct Investment inflows are channeled through the Automatic Route which does not require erstwhile approval from the FIPB & is subject to sectoral rules. 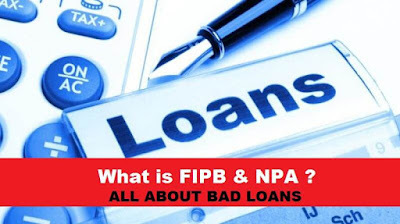 FIPB was initially constituted under the Prime Minister’s Office (PMO) in the wake of the economic liberalization drive of the early 1990s. A Non-Performing Asset (NPA) refers to a classification for loans on the books of financial institutions that are in default or are in arrears on scheduled payments of principal or interest. Mostly, debt is classified as non-performing when loan payments have not been made for a period of 90 days. While 90 days of non-payment is the standard period of time for debt to be classify as non-performing, the amount of surpassed time may be shorter or longer rely on the terms and conditions set forth in each loan. Non-performing assets, also called non-performing loans, are loans, made by a bank or finance company, on which interest payments are not being made on time. Loss Assets – As per RBI, "Loss asset is considered noncollectable and of such little value that its continuity as a bankable asset is not warranted, although there may be some recovery value. "Doubtful Assets – An asset would be classified as distrustful if it has remained in the substandard category for a period of 12 months.Sub-Standard Assets are those which are non-performing for a period not exceeding two years i.e. a period less than or equal to 12 months. Carrying nonperforming assets also referred to as non-performing loans, on the balance sheet places three individual burdens on lenders. The non-payment of interest or principal lessens cash flow for the lender, which can disrupt budgets and decrease earnings. Loan loss provisions, which are set aside to cover potential losses, reduce the capital available to provide next loans. Once the actual losses from defaulted loans are determined, they are written off against earnings.